I listen to podcasts most days at work, on topics, to include: news, entertainment, gameshows, cooking, crafting, and lifestyles, from bloggers talking about what they talk about. Most recently, Most specifically, I was listening to Joy the Baker and The Simple Mom as they shared blogging advice. Yesterday, I while I was listening I was getting antsy at my desk thinking about how much I wanted to take to the keyboard and lay out some thoughts. I don't want to make a business of my blogging at this time, but I do want to reach you, the reader, with ideas and enthusiasm as we scout for architecture together. My first post was nearly a month ago and I have been experiencing guilt pains over how business-y it was and have come to the realization that I need to chill out a bit and get in real talk mode. My husband began blogging as well and I can't help but imagine us spending Sunday afternoons at an internet cafe sharing our thoughts with the world and chuckling over sentence structures and word choices. Of course, I will continue the narrative of my thesis project over the course of the year, but I will also be scouting for architecture in other aspects of my life. --Anyway, the academic year is starting up again. I enjoyed some back to school shopping with a dear friend this weekend so I am really getting geared up. The problem with starting a sixth year of undergrad is explaining why I am starting a sixth year of undergrad. "No, it's not a masters program," "I knew that I would be in school for six years," "I work full time and go to school at night." These are just a sampling of the phrases I will use to defend my situation throughout the year to come. But to support my defense, I plan to focus on the ideas from my thesis and getting whoever it is that I am talking to, to understand and believe in my research and design. What better way to be able to converse about what I am working on, than to have an explanation in my back pocket at all times. Enter, the business card. 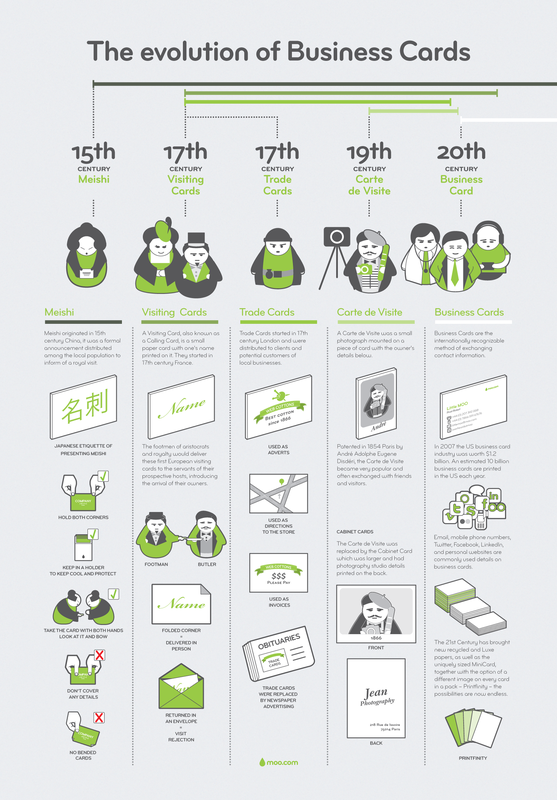 Moo has put together this infographic to describe history of the business card. While the delivery has changed over centuries past, the goals of the cards have stayed the same. Business cards are in the business of explaining yourself -- what you do and where you do it. I hope that my business card will start to get at the why and how I do architecture. I came across an article in Entrepreneur Magazine a few months ago that encouraged readers to converge their business cards with their online identities. The article suggested including a status update or other relevant tidbit on the card in some way. So this is what I am thinking...I want to come up with an infographic of three icons to describe my client (Girl Scouts of Eastern PA), site (1300 block of Ridge Avenue), and building concept (integrating civic building with specific audience to improve a neighborhood) on the back of a standard 2" x 3.5" business card. [Sorry the colors are a bit off on these uploads]. I would love to hear what you think and to check out other creative examples of business cards. Few things are more intimidating than the blinking cursor on a blank screen. The page is waiting to become a story, report, poem, or even a manifesto. I have yet to collect my thoughts in a form that would be useful as a guide to anything for those who follow me, but I hope to start to build my thought legacy through this blog. I do not care to admit how many journals and diaries I have started over the years, with the intent to catalog my ideas and experiences. The multitude of spiral bound notebooks, sketchbooks, pads, and locked hardcovers have been stored away or even discarded as unsuccessful attempts at capturing my thoughts. My most successful writings have been notes to my parents or dear friends when I have to admit something or apologize when I have encountered times that I could not deliver my thoughts aloud. Writing has provided me with a venue to reflect and project -- with thoughtful consideration for each word at times, and at others, with genuine stream of consciousness. Here, I will attempt to hover around that line of information and emotion as I embark on my thesis year of architecture school. I find that I learn best when I write. I am a list maker. I draw a lot of arrows to connect concepts. I use symbols to represent various information in my notes. I love timelines, charts, and tables. I collect images and fragments. I collage. I like having an agenda and knowing what comes next. 1. Present research in narrative forms to develop my writing skills. 2. Experiment with presentation styles. 3. Recount experiences with my "client," interactions with the building site, and study of precedents. 4. Seek feedback from anyone and everyone willing to share it. 5. Digest and reflect on criticism throughout the project. The project I am developing is a regional urban campus for the Girl Scouts of the USA in Philadelphia (hence the cheese factor of the blog title). This building will be the center of a study of introducing civic buildings with very specific audiences to neighborhoods seeking growth opportunities. I hope to discover how such a center can promote commercial and residential development. I will also introduce sustainable practices and develop a master plan for improvements to surrounding sites that will interact with the campus' program. I recently read an article that expressed "you are what you share. "1 This can be taken both literally and metaphorically, but it is known that the opportunities to represent yourself online are growing. My thesis will reinforce and help me to uncover interests that I plan to pursue in my professional years ahead. I look forward to sharing these discovery experiences in this space that is no longer a blank page. 1 Leadbeater, Charles. "Welcome to We-think: mass innovation, not mass production." We Think. 2008. 29 July 2012. http://www.wethinkthebook.net/home.aspx.